L ong experience in the use of audio frequency buzzers to modulate the output of a tube set to produce damped wave trains has proven that this method is not entirely satisfactory, principally for the reasons that the operation of the buzzer is not constant, necessitating frequent adjustment, and that great care is required in adjusting the circuit to obtain 100 per cent. modulation. (a) Gives positive interruption, requiring no adjustments. The note obtained can be varied to any desired pitch by changing the driving motor speed. (b) This system of securing damped wave trains does not require modulating tubes, the interrupter being used in series with the transmitting key. (c) The system inherently gives 100 per cent. modulation, since oscillations can be completely started and stopped at audio frequencies. (d) The output obtained from a given number of oscillators is in general greater than if some of the tubes are used as modulators. 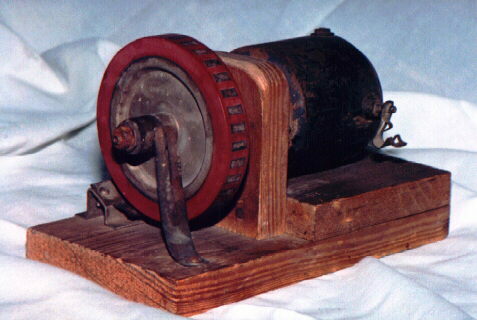 (a) Interrupter Wheel, Model PX-1638. (b) Two Bushings, so that the wheel may be mounted on motor shafts ¼ in., 5/16 in., or 3/8 in. diameter. (c) Brush Holder and Brush. The interrupter wheel is built with 34 conducting and 34 insulating segments, making 34 interruptions per revolution. The insulating segments are molded in a single piece. Dimensions: 4 in.x 134 in. Transmitter for C.W. and I.C.W. (Grid Chopper). 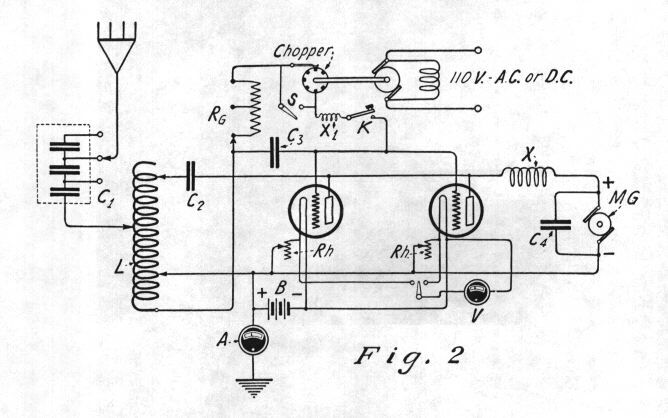 Circuit for Operation from D.C. Supply with Radiotrons UV-202 or UV-203.